“It was a tale of two seasons” is one of the most overused writerly devices, but if it ever applied to a franchise, it did to the 2018 Cowboys. The team went into its Week 8 bye at 3-4, averaging 20 points a game and with no back-to-back wins all season. The conversation was more about when Jason Garrett would lose his job than whether the Cowboys would make the playoffs. And then the trade for Amari Cooper happened, and whether it’s correlation or causation, the season flipped. For the nine weeks after the bye, the Cowboys went 7-2, took over first place in the NFC East, and made the Divisional Round of the playoffs. Cooper was the No. 8 fantasy receiver over that stretch, while Dak Prescott was the No. 4 quarterback, Ezekiel Elliott the No. 2 running back. The team had plenty of flaws overall and took advantage of a down NFC East in many ways, but it was still a season that went from nearly disastrous to one that likely earned Garrett an extension. 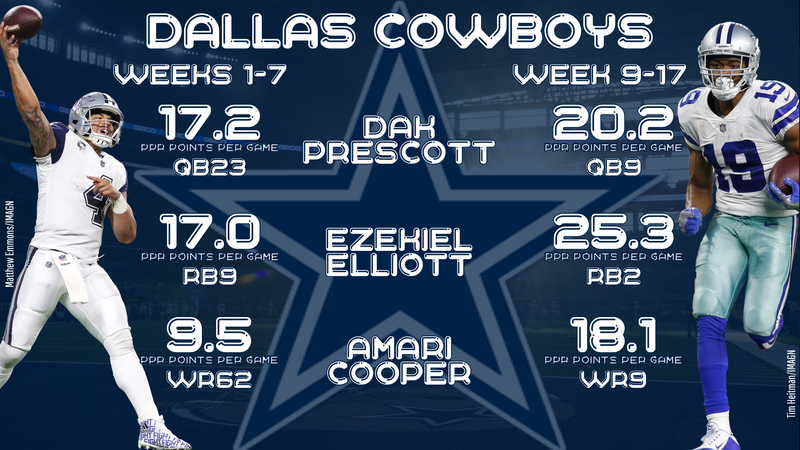 There is room for improvement on the Cowboys, but the situation isn’t nearly as dire as it might have appeared only a few months ago. Cole Beasley is hitting free agency, and considering his tone about how things were in Dallas, it’s hard to imagine him re-upping there. That leaves a gaping hole at the slot receiver position, given the two most likely holdovers in the receiving corps — Cooper and Michael Gallup — combined for 16 targets out of the slot in 2018. Tate, splitting his year between Detroit and Philadelphia, had 72 targets out of the slot, or two more than tied-for-ninth-most Beasley. He could slide right into Beasley’s role without missing a beat and help keep Prescott safe with short-pass opportunities. Unless you are really, really sold on that ridiculous Week 17 game being who Blake Jarwin really is, the Cowboys have a gaping need at the tight end position. The position had 88 targets in 2018, with exactly one touchdown to show for it before Jarwin’s three-score season finale. None of Jarwin, Dalton Schultz, Geoff Swaim, and Rico Gathers did enough to cement their role as anything more than a complementary piece in the immediate future. That opens the door for James, who has never exactly been a superstar as a fantasy option in his career in Pittsburgh but has been an elite blocking tight end. If he can score the No. 1 role in an offense, he has good upside — see the first month of 2017, when Vance McDonald was hurt and James responded with top-10 fantasy numbers. Dallas has shown it has no problem leaning heavily on a tight end, lest you forget the Jason Witten era, and James could be the next man up. That’s likely to be the strategy no matter who joins the club, but for the sake of insurance, a free agent signing like Peterson would be interesting. If Peterson would be amenable to a backup role, he is capable enough to spell Elliott and keep him fresh and would be an easy plug-and-play option if anything were to happen to the starter. And the Cowboys have a couple of years of experience with a running back in young Elliott they don’t throw to a lot (before expanding his repertoire in 2018), so Peterson’s one-dimensional approach wouldn’t be disastrous if he were in the backfield.